As you probably know, Columbia is Muletown. It was also a horse town not so long ago. When you have livestock, you have to have a watering hole. Columbia did in many places, but few as prominent as this one that was on the East side of the Maury County Courthouse on E 7th St. near the intersection with Woodland St. 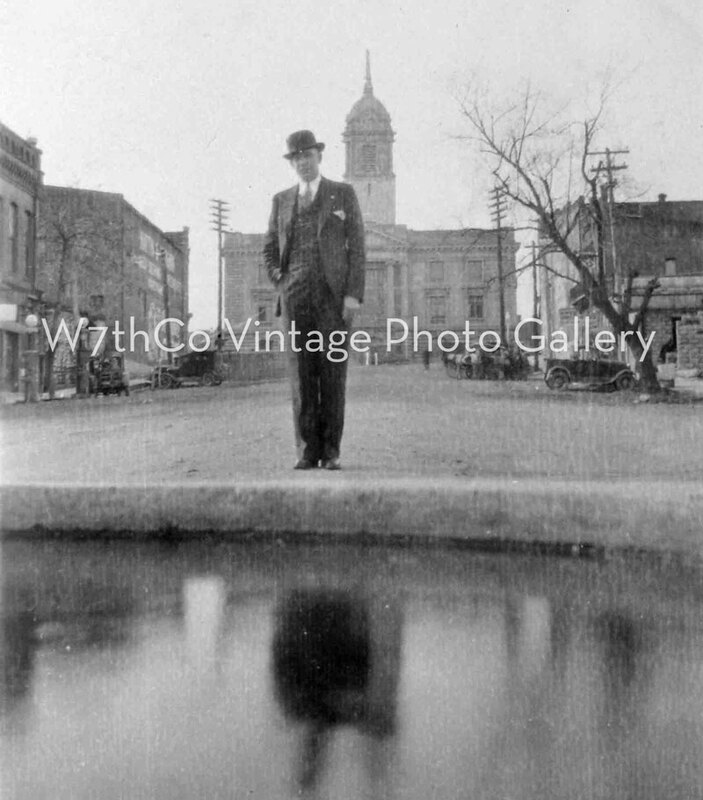 Recently we discovered this great photo of a dapper fellow and his reflection in the watering trough with the Courthouse in the background. We are not sure, but it may be Tom Butler (Butler’s Mill was located at this intersection). All indications are this is early 1930’s as the Dr. Pepper ad on the side of Martin & Vaughn, 11 Public Square, was painted over by 1936. We have lots of photos looking East on this street and usually there are so many people, horses and mules, that you can’t see this landmark. However, in this rare Western view, you can catch a glimpse of how things used to be before motorized horse power replaced the actual thing. According to Frank Sowell’s book, All the Old Familiar Places, this trough was originally located on E 7th at Public Square, but was later moved to the Woodland intersection. Do you know more about this photo? We’d love to hear from you. We’re working to pin down the year and confirm (or not) that this is indeed Tom Butler.